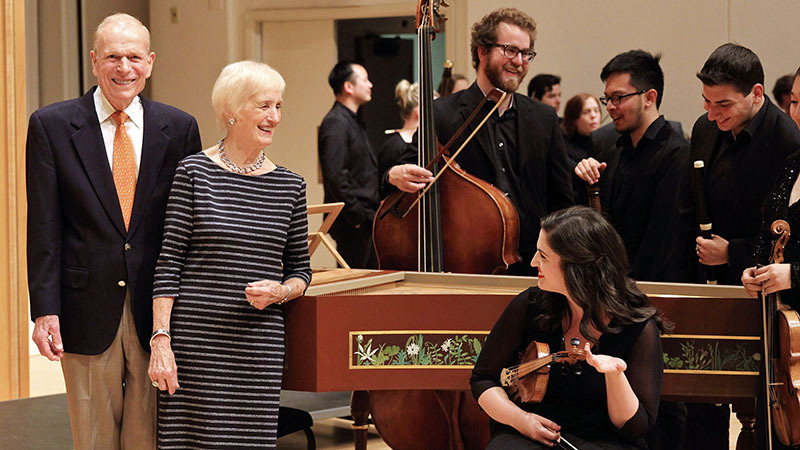 Oregon Bach Festival audiences will soon have a chance to hear baroque music the way it was presented as much as 400 years ago thanks to the work of the UO’s donor-funded Berwick Academy. Historically informed performance gives audiences rare opportunities to hear Baroque music as it would have sounded when the work was first conceived. Musicians use historically accurate techniques and instruments designed to resemble — as closely as possible — instruments from the past. While historically informed performance has long been the standard in Europe, the Berwick Academy is one of a handful of educational programs in the U.S. that exclusively features period performance. Its faculty members and directors are top performers and educators in the field. The Berwick Academy is modeled on the European Union Baroque Orchestra, an important early music training program founded in 1985. Oregon Bach Festival Artistic Director Matthew Halls, whose period-instrument recordings have received major acclaim, is an orchestra graduate. The academy started in 2015, thanks to a $7.25 million gift from University of Oregon alumni Phyllis and Andrew Berwick. Through their generosity, the academy is tuition-free for all selected musicians. The Berwicks met as UO students in the 1950s and have been involved and engaged as longtime donors and volunteer leaders for both the university and the Oregon Bach Festival. The cautionary tale of fatal attraction between a goddess and a mortal hunter is believed to be the earliest surviving English opera, dating back to 1683. John Blow's blend of witty libretto and supple, flirtatious turns create what The Guardian calls an "exquisite masterpiece" and a heartbreaking tragedy. The English piece will be complemented by works from French composers Lully and Rebel. Lars Ulrik Mortensen conducts from the harpsichord for the final Berwick Academy concert of 2017. The recipient of the prestigious Sonning Music Prize — Denmark's highest musical honor — Mortensen conducts an evening of energetic works from French Baroque composer Jean-Philippe Rameau, exemplary pieces from Muffat and a Don Quixote tale from Telemann.